Adair County Sheriff (8/28/18) - The Pro-Tektor®, Inc.
Kirksville, MO. 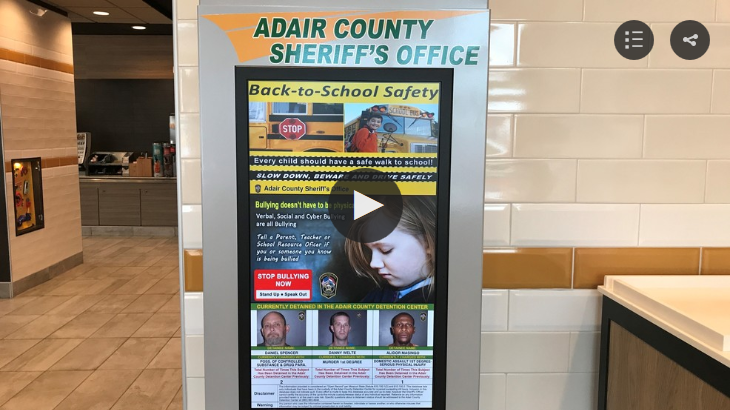 — The Adair County Sheriff’s Office has partnered with local businesses to install a new kiosk system that the public can use to help law enforcement find wanted criminals. ‘”We’re always looking for new ways and ideas of doing things here in the sheriff’s office,” said Adair County Sheriff Robert Hardwick. It’s called a Community Protractor kiosk system and the Adair County Sheriff’s Office is the first law enforcement agency to implement something like this in the state of Missouri. ” You can put on public service announcements. Amber alerts are automatically populated on the screen,” said Hardwick. The system also shows wanted individuals, persons of interest and detained individuals along with their name and charge. ” That’s all public information. The public has a right to know and I feel the public needs to know,” said Hardwick. There are currently four kiosks in Kirksville. They are located at the north and south McDonald’s, Menards, and HyVee. ” Instead of an individual going out and seeking information, a lot of times, that is right there for them to see that and draw their attention to that,” Hardwick said. Hardwick says they want to get as many kiosk systems out into the public as they can. Another law enforcement agency in the state of Missouri is expected to follow in Adair County Sheriff’s Office footsteps and release four kiosk systems in their community. Tax dollars were not used for this project. Hardwick says the funds were allocated by the law enforcement restitution board. To watch a tutorial of how the system works click here.